How does Gunter Pest Management treat for Bed Bugs? Rather than using harsh chemicals, sprays, or “bug bombs” to treat Bed Bugs, Gunter’s bed bug exterminators use the proven effectiveness of heat treatments to exterminate Bed Bugs. Not only is this the most effective method, it’s also the most environmentally friendly! Gunter’s technicians increase the temperature of the infested room or area to levels that are lethal to Bed Bugs; all stages die instantly at 122 degrees (eggs, larvae, and adults). In order to assure that every crack and crevice reaches lethal temperature, our heaters generate 135 degrees Fahrenheit and we hold the temperature for a minimum of half an hour. We administer the heat using high-velocity fans which are focused on crucial spots where bed bugs live. This eliminates bed bugs in all areas of the structure and its contents. A distinct advantage of heat is that, unlike chemical treatments, heat can penetrate cracks and crevices and inaccessible areas where bed bugs reside. Wireless transmitters feed a remote monitoring station to assure every area involved in the treatment reaches lethal temperatures. For effective use of high temperatures to control bed bug populations it is essential to know the survival characteristics and behavior of Bed Bugs at various temperatures and exposure times. Also important is the rate of penetration of lethal temperatures on different types of materials within the structure being treated. Bed Bugs are stimulated by a rise in air temperature and tend to forage or feed as air temperatures rise near 100F to 115F. This draws Bed Bugs out of harborage areas and towards heated zones positioning them closer to areas where they will encounter lethal heat and farther from possible escape routes. The gradual rise in temperature never triggers an escape response; rather the bed bugs seek the closest thermal refuge and die in that arena. Ultimate elimination takes place when air temperatures reach 135F and our technicians manipulate the contents of the room exposing the last few refuge areas, proving fatal for any bed bugs within those locations. So stop using pesticides as they are a big waste of your time and don’t actually do anything to kill bedbugs. Gunter Pest & Lawn uses an extreme heat treatment that is proven to eradicate any bedbug infestation in just one visit. Our professional bedbug exterminators use a heating device which raises temperatures in the bedbug-infested area to 120°F for about 90 minutes. Non-toxic means no danger to your children or pets. Kills bedbug infestations at every stage of life. This includes eggs up to adults. Thermal or Heat treatment will reach the tiniest crevices that bedbugs like to hide and lay eggs. After the heat treatment, there is no need to wash and dry items exposed to the infestation. Our thermal bedbug heat treatment does not use pesticides or chemicals. It’s just heat which is safe for all. Our thermal bedbug treatment is good for infestations in your residential home, hospitals, commercial establishments, hotels, nursing homes and any other enclosed area that might serve as a host to a bedbug infestation. Bed bugs love vacations and have perfected their craft in hitchhiking. They will hide in suitcases, boxes, and shoes to be near yummy snacks. They are elusive, nocturnal creatures. They’re great at playing hide and seek behind baseboards, in cracks, crevices and folded areas of beds, bedding and adjacent furniture, especially mattresses and box springs. Sneaky Bed Bugs can also hide in electrical switchplates, picture frames, wallpaper and nearly anywhere inside a home, car, bus or other shelters. Bed bugs tend to venture out of their hiding spots at night for a blood meal. However, they are opportunistic insects and can take a blood meal during the day, especially in heavily-infested areas. Glutinous Bed bugs usually require five to ten minutes to engorge with blood, vampire style. After feeding, they move to their next Bug bug life cycle in a secluded place and hide for five to ten days. During this time, they do not feed but instead digest their meal, mate and lay eggs. Bed bugs like to hide in small cracks and crevices close to a human environment — they can be quite needy pests. They can be found behind baseboards, wallpaper, upholstery, and in furniture crevices. Bed bugs are known to survive in temporary or alternative habitats, such as backpacks and under the seats in cars, buses and trains. 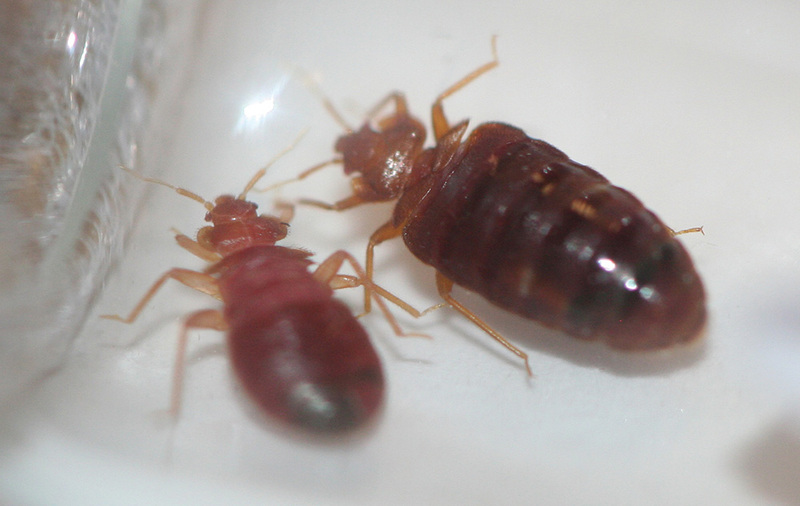 Although Bed bugs may dine on any warm-blooded animal, they primarily dine on humans…How rude! 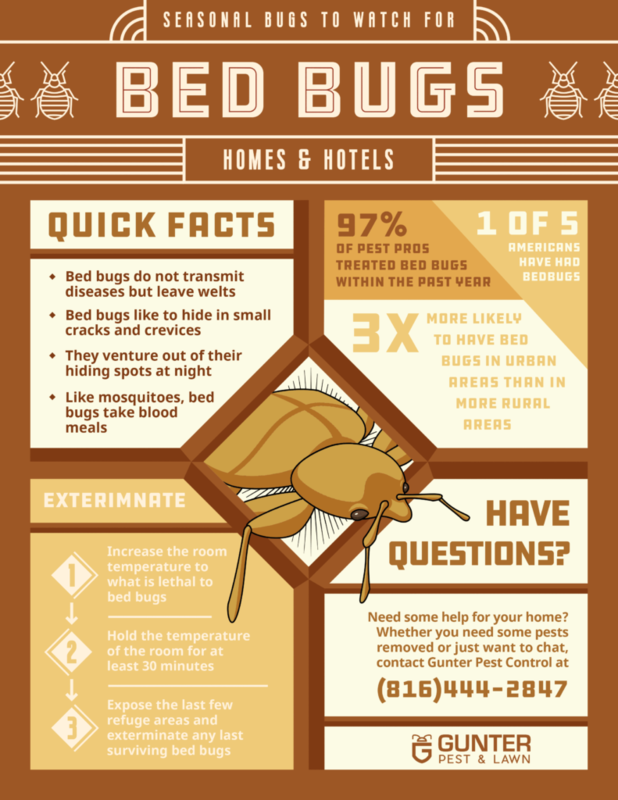 Bed bugs do not transmit diseases, but their bites can become red itchy welts. Call Gunter Pest & Lawn to help with the extermination of your bed bugs. We also offer all of these locations at our St. Joseph, MO Pest Control location.